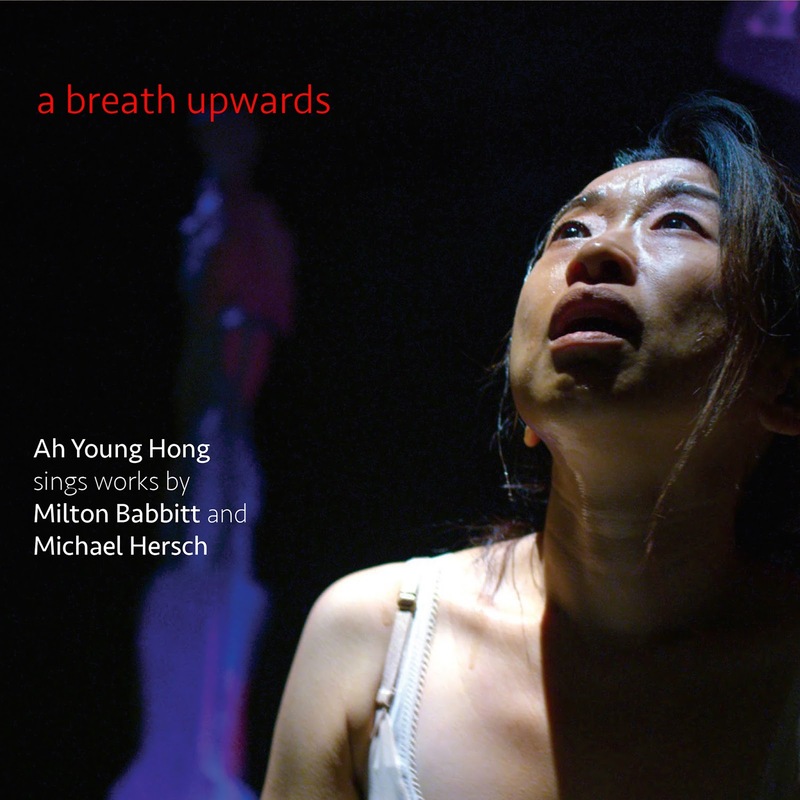 Powerful High Modernism today from vocalist Ah Young Hong on the recent CD A Breath Upwards (Innova 986). The album features two brilliant and dramatic American works, one by Milton Babbitt and one by Michael Hersch, of course both major voices in New Music avantism past and present. From Babbitt there is "Philomel" (1964) for soprano and computer electronics; from Hersch the title work (2014) for soprano and chamber ensemble. Both scores call for dramatic and demanding soprano roles. Ah Young Hong is a phenomenal vocalist best associated with Hersch's operatic monodrama On the Threshold of Winter. Her pitch and timbre control are outstanding and the dramatic verve she brings to the music is exactly what is needed to put these works in an ideal place. The Babbitt piece was created out of three critical intersections, as the liner notes to the CD so helpfully and eloquently point out. The behemoth RCA Mark II Sound Synthesizer entered the Columbia-Princeton Electronic Music Center in 1957 as Milton Babbitt's special charge. Babbitt's complex inventions via the cumbersome contraption helped define his musical life. And so that Synthesizer forms the canvas backdrop for "Philomel." So too his coming under the spell of the soprano virtuoso Bethany Beardslee was critical. She could perform virtually anything he might envision and make it musical and nuanced. She commissioned the work that we hear now. The final piece of the puzzle was supplied by poet-librettist John Hollander. He complemented Babbitt in his virtuoso grasp of language and his musical understanding. Out of this we hear in this Hong performance version what it all came to. It is firey and openly dramatic. The very difficult soprano part is squarely situated on Hong's familiar turf and she shows us how to do it poetically right. The Hersch work relates to the Babbitt in the way it uses a wide vertical musical space to carve out dramatic declamation and set mood. The instrumentation is surprisingly full sounding with viola, clarinet and horn manipulating the sound and pitch color possibilities of the three instruments against the bold and expressive soprano part. The text is from Pound's Cantos. The music-text intersection is typical of Hersch's brilliant reworking of the high modernist possibilities to suit his own expressive needs. Each part of this remarkable whole fits wonderfully well with the other elements. So a very musical three-instrument scoring paces perfectly with the vocal lines. These two elements conjoin with text for a most meaningful whole. As with Hersch at his best, the style on the surface comes out of the High Modernist cannon. You listen more and nearly at once there emerges Hersch the consummate and moving voice for today. That stays with you long after the music is concluded. These are landmark performances of two landmark works we need to take into account, appreciate, enjoy, explore.